How would you improve KHIII (and the whole Dark Seeker saga)? Since I've seen a wide range of thoughts from many people in the forum, especially regarding the final instalment of the Dark Seeker saga and its outcome, yet I haven't seen much of what could've been done better. I thought I'd make a thread for for those who would like to express their ideas on what changes, additions, and so on that they could've and would've done to make this better in their opinion. Feel free to do so, no flames, no attacks, thank you. I've seen this many times before, and I'm sure that many people will repeat it after me, but this game is severely lacking in any kind of "midpoint" a la Radiant Garden/Hollow Bastion in KH2, or even the OG Hollow Bastion first visit in KH 1. The game has many, many other problems that could really only be solved with a full rewrite of the Keyblade Graveyard and various other areas, but adding in this mid point would be a really good start. The point of adding this little "break" so to speak, would be to chop up the Disney worlds and provide more variety and more original world content. Fighting an organization member or two, having a lore dump, maybe even saving someone in that midpoint would do wonders towards improving the pacing and would actually give us an original world to explore... unlike the final game. It could be Radiant Garden, Twilight Town, the Keyblade graveyard, it honestly doesn't matter. The Disney worlds can drag on a bit, especially with the little tidbits of story we get in between, and a more solid section would just improve the game overall. Difficuilty. Honestly, the harder difficuilty settings should actually be difficuilt. So many of the bosses in this game could have had the perfect opportunity to pose a challenge. To add to the above, the first thing I'd do is add a solid midgame in Radiant Garden, where we play as Riku and find out whatever the heck it was they were doing. Actually screw that, that can happen after corona/toy box are cleared. Then we go fight Aqua and bring her back. After Arendelle, which was a *huuuge* bore, we pick up the pace by bringing back Roxas/Ven then. That could include Twilight Town and Radiant Garden, then we're back on track with the two hypest disney worlds which keeps up the momentum for the final showdown. Honestly, building off of what quid said, I almost wish that we had reunited either of the trios before the final showdowns. Imagine in the BBS trio got the time they needed to recover and get caught up with each other, or if Ienzo and Vexen's research was completed onscreen, allowing for Roxas and Axel to recuperate, maybe even reuniting with Xion. Having that time in the middle to get some plot out of the way would make the boss rush at the end of the game feel a little less... forced, and rushed I feel. Yes. Sora needed to really start saving people WAY before the ending hit. Saving it all for last left little time for them to really be together before the final battle. There was that moment with Aqua and Ven outside Yen Sid's tower which was fantastic. Every relationship needed a moment like that spread out throughout the game, not stuffed into the ending. Really, if they had saved Aqua earlier in the story, that would also have saved Ven. That's a great midpoint to a game imo and could have opened a new hub world, LoD. Could've added some training mini games. Or used it to drop some lore about LoD/SaC since we don't know jack about it really. Coulda saved Roxas way earlier too. Maybe 3/4's of the way through the game. I mean... his entrance in the final battle was pretty amazing. But I would've liked to see him waking up as his own person for the first time with Sora and the TT crew. And seeing Lea/Axel again before the final battle. I also would have brought Lea and Kairi out of training WAY earlier. They should have been exploring and training in their own Disney worlds, not just locked up in a time chamber because obviously that didn't do them much good. This would present more opportunities to show us their growth, their growing friendship, and character building in general since Kairi still didn't get much of anything imo. That would leave the only two left to save being Terra and Xion and I feel like that would've given them more time to make their rescue even more emotional. If that makes sense. Coulda spent more time focused on it. More dialogue. Something. And then thinking about Twilight Town, they should've let us explore more of the town. Sora could visit all the places Roxas hung out and brought Roxas out of him more or something. A trip down memory lane. That would've been awesome to see. Not just because Sor anad Roxas are adorable, but to see old KH2 locations in high def would've been awesome. And I'm sure I'll come up with more tweaks as time goes by. One small minor change I would have during the final battle is the fight with Siax and Xion, in that I would make it so you have to fully and completely beat Siax twice (basically get his heath down to zero twice), rather than how it is now where you beat him a bit, he goes beserek, and Xion and Roxas replace Kairi and Lea. Doing it this way I think would allow for you to fight alongside Kairi and Lea longer, instead of feeling like you barely fight alongside them. I would give everyone mustaches. You'd think this is just one of my jokes (and you'd be right) but I'm serious when I say everything would improve 100% from it. - Add Radiant Garden between San Fransokyo and the Keyblade Graveyard, where Sora interacts with some of the other original characters (Aqua, Ventus, Kairi, Lea, Even, Ansem the Wise, Demyx, Lexaeus, etc.) along with *at least* a brief howyadoin' with Squall and/or Yuffie. I'd have liked either Squall or Cid to call you on the Gummiphone once or twice. - Give 100 Acre Wood an abbreviated story about Lumpy; the return visit is the minigames with the garden. - Add 1 more Disney world. - Make bosses out of Randall, Gothel, and Hans. - Re-create "I See the Light" in Corona. - 1 30 or 50-round tournament on the top of Olympus in the Hercules post-game, where the final boss is Zeus. The #10 round is the rest of the GoLs versus SDG. - TAV get new outfits. Maybe Namine, too, although I've always liked her white dress. My only story change would be that Repliku survives somehow and we see him in the Secret Ending, maybe? I still have hope he might be revived in the next game anyway. The most pressing thing that kept popping into my mind even when playing was having a better structured DDD that took upon itself to explain AT LEAST KH III's first third, so that KH III could get into the meat of things instead of spending time making the characters catching up on what the audience already knows. I feel like difficulty was adjusted due to the Xbox version and its audience. I feel like they didn't want to make it that difficult so it would turn new players away. For me, it would be googly eyes. So what you're trying to tell me, is that the entire Kairi thing[asidefromthekidnapping] could've been avoided, if the boss fight she was a part of was longer. More worlds. Specifically, roughly 10-11 Disney worlds and 4 original worlds. Better balance between 2D and 3D Disney films. Pace the story better. It seemed like the last 5 hours were specifically for the original plot. Should've made it where we had major original story points in the beginning, middle, and end. Randall needed to be a boss (I will probably never get over this). More interactions between the characters. SDG felt like they were off doing their own thing while the film is going on, never got to really spend time with the cast of the film. Kind of same thing as Arendelle, what was the purpose of having SDG get separated from the pirates? We missed possible interactions and a proper first intro to Davy Jones instead of SDG jst running into him during the final fight. Make the core plot longer. Felt like we meet the cast, get separated, find a ship and crabs, then final battle time. Honestly, make the maelstrom fight far more dynamic and chaotic. I was hoping we'd be swinging between the 2 ships fighting off Jones' crew and defending ours. Would've been really really sick. Needed to be explorable and feel like a true final world, not just a final battlefield. Customizable Costumes and Outfits. Togglable hoods up/down. SuperGroupies Outfits. KH2: Facing Xemnas versus Riku/Sora was great. The moment where Riku has to save Sora was great too. KH 3D: This was a bit underwhelming I admit. This fight vs Xehanort should have been 7 on 1 with all the heroes of light fighting against Xehanort. Maybe have a sequence where you take control of each hero for a segment of the fight. Just having S/D/G do it did not feel as much emotional. 1. Have Randall be a mid boss before the big Unversed one. It would make more sense for him to lose the first time and resort to something better. 2. Give Gothel control of the heartless and nobodies. 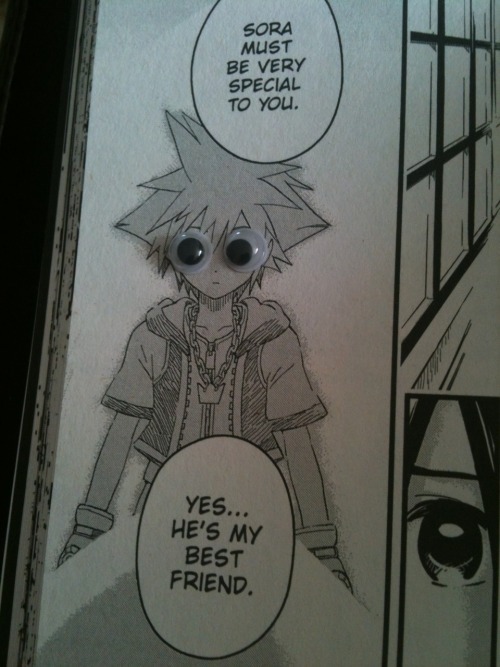 Would certainly justify Marluxia's eye scene. 3. Save Namine much sooner and give her some dialogue. 4. Have SDG more integrated with the Arendelle plot. Have Larxene visibly interact with Elsa. Include the Arendelle town itself. 5. Show Isa apologizing to Roxas and Xion. 7. Include Zurg for Toy Box. 8. Add Lightning to Olympus. By giving Xehanort a more defined and fleshed-out motivation. Olympus as an opening and following up with Twilight Town is fine. However, some of the interlude between Mickey and Riku happened throughout there and I would have really preferred to see all that in one big chunk instead of in pieces. Mostly because the loading that takes place between transitions. It's shorter when it connects to another cutscene and longer when it is broken up. I'm sure they'll find a way to improve load times if/when we get Final Mix++ like they did with 1.5+2.5 so hopefully it'll break up some of that down time. In the same respect, there were a lot of loading screen breakups that felt a little too disjointed from the flow that could be repaired. San Fransokyo and The Carribean happen, we get the news about Roxas, and the teams now rested congratulate each other and get ready for the final battle. The last day events and even the labyrinth events were perfect imo. But if we use that as a first visit to Keyblade graveyard, then show the futility of the situation, then cut back in time like he did, use the help of the past wielders, and then either get control of the party characters during the fights in the labyrinth or get a more definitive cutscene for it (thus showing time flowing the same way) THEN have a mcguffin for what would stop the timeline from being exactly the same, xehanort retorting that it's too late anyway, then following the same finale with Kairi, Scala ad Caelum, and finishing with the Final World. Meeting those stars, putting Sora back together and then realizing he can't go back again but that someone or something is calling him somewhere (which would then hint at the secret movie) would feel a lot more bittersweet to the player and when we see him fade away at the end it would have been more sad than rage inducing (others opinions, not mine). Epilogue and Secret movies both still make perfect sense (if not more) in this context. However, as stated above I still think it's perfect so making these adjustments would only make it better to me. I still can't wait for KH4 and any dlc/Final Mix we get for 3. Should have had more Vanitas and Larxene interactions!